The Warm Springs Highway is a gentle drive through Oregon’s largest Native American reservation, offering views of the Oregon Desert, the spectacular Cascade Mountains, and the Deschutes National Forest wilderness. Highway 26 south from Government Camp to Warm Springs forms the scenic Warm Springs Highway. Traverses the Warm Springs Indian Reservation, Oregon’s largest reservation home to three Native tribes. Museum, resort, casino, and outdoor activities make this route special. East of the Cascade Mountains and their crown jewel, Mt. Hood, the climate becomes more arid and the landscape dotted with sagebrush and juniper. Here Highway 26 becomes the Warm Springs Highway, a quiet scenic route through the Warm Springs Indian Reservation. Three Native tribes (Wasco, Paiute, and Warm Springs) make their home on this 1,000-square-mile reservation, which stretches across five Oregon counties. From the Mt. Hood Villages, take Highway 26 south toward the town of Warm Springs. Total distance from Government Camp (at the base of Mt. Hood) to Warm Springs is about 50 miles. Visitors should allow one hour each direction, and 2-3 hours more to enjoy the sights and points of interest along the way. The Museum at Warm Springs exhibits more than 20,000 Native artifacts, lodging replicas, and more; hiking trails are accessible nearby, and there’s an amphitheater where native performances are held. Kah-Nee-Tah Indian Resort offers lodging, hot springs, camping, dining, golf course, and the Indian Head Casino. Hiking, white-water kayaking and rafting, horseback riding, and other recreation are popular in the Warm Springs region. 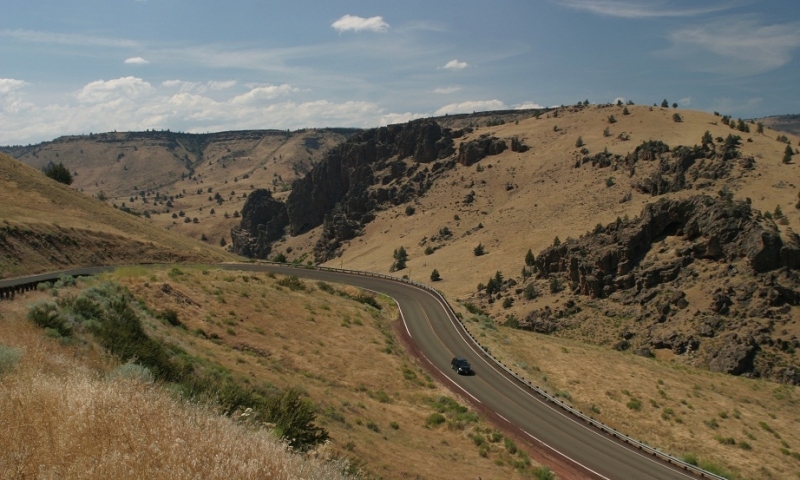 Warm Springs Highway crosses the sheer canyons of the Deschutes River at the edge of the reservation.